90% of the equipment we manufacture ends up being inserted into a borehole. If that bore hole is blocked, bent, sheared or collapsed it is important to know where and how. So often this is left to guess work. In the case of inclinometer casing it can be very expensive to lose a probe in a sheared hole. 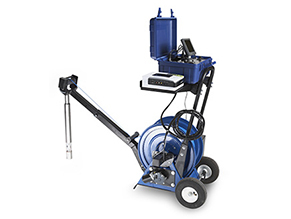 The answer is a borehole camera system, these small colour cameras can inspect, and record the conditions of a borehole or casing without risking an aborted installation. Simple to use and available for purchase on hire.